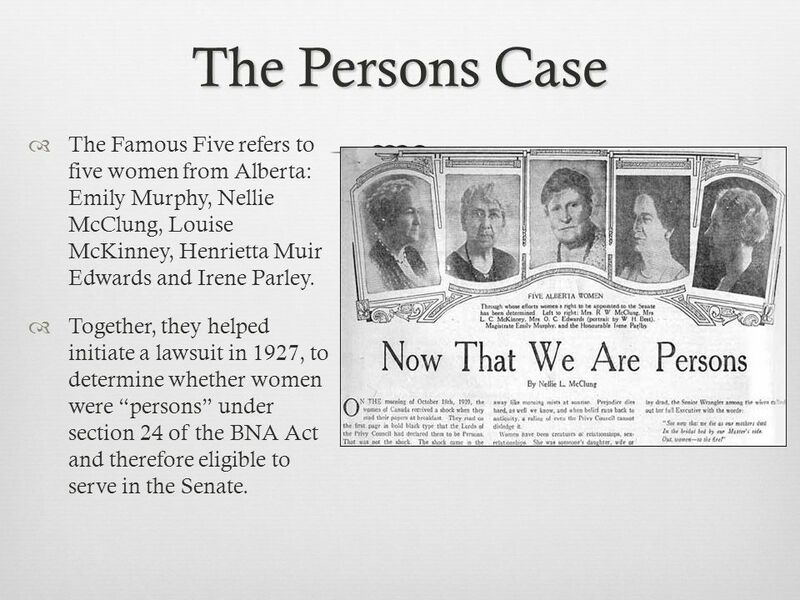 The Persons Case  The Famous Five refers to five women from Alberta: Emily Murphy, Nellie McClung, Louise McKinney, Henrietta Muir Edwards and Irene. 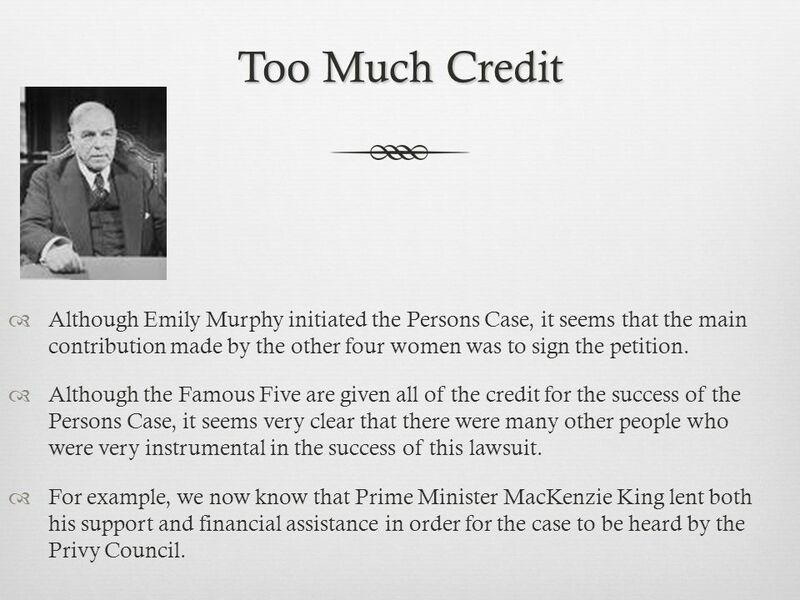 2 The Persons Case  The Famous Five refers to five women from Alberta: Emily Murphy, Nellie McClung, Louise McKinney, Henrietta Muir Edwards and Irene Parley.  Together, they helped initiate a lawsuit in 1927, to determine whether women were “persons” under section 24 of the BNA Act and therefore eligible to serve in the Senate. 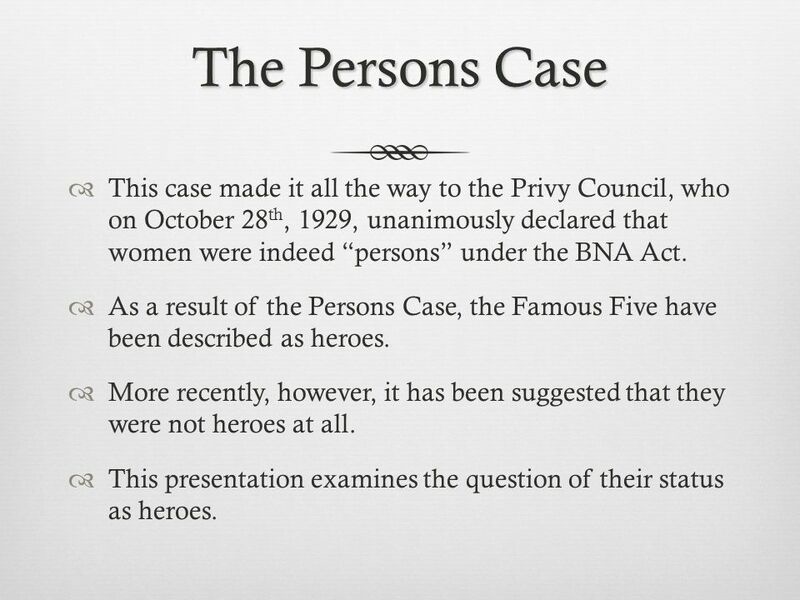 3 The Persons Case  This case made it all the way to the Privy Council, who on October 28 th, 1929, unanimously declared that women were indeed “persons” under the BNA Act.  As a result of the Persons Case, the Famous Five have been described as heroes.  More recently, however, it has been suggested that they were not heroes at all.  This presentation examines the question of their status as heroes. 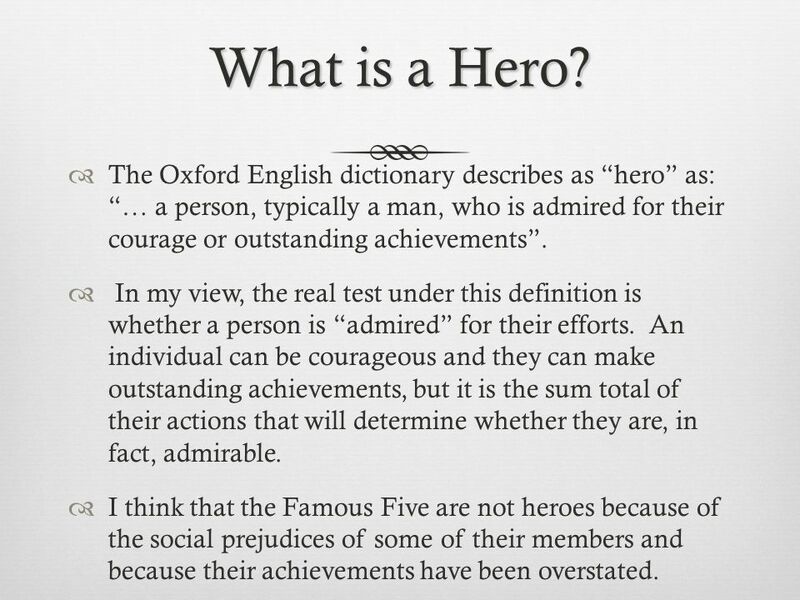 4 What is a Hero?  The Oxford English dictionary describes as “hero” as: “… a person, typically a man, who is admired for their courage or outstanding achievements”.  In my view, the real test under this definition is whether a person is “admired” for their efforts. An individual can be courageous and they can make outstanding achievements, but it is the sum total of their actions that will determine whether they are, in fact, admirable.  I think that the Famous Five are not heroes because of the social prejudices of some of their members and because their achievements have been overstated. 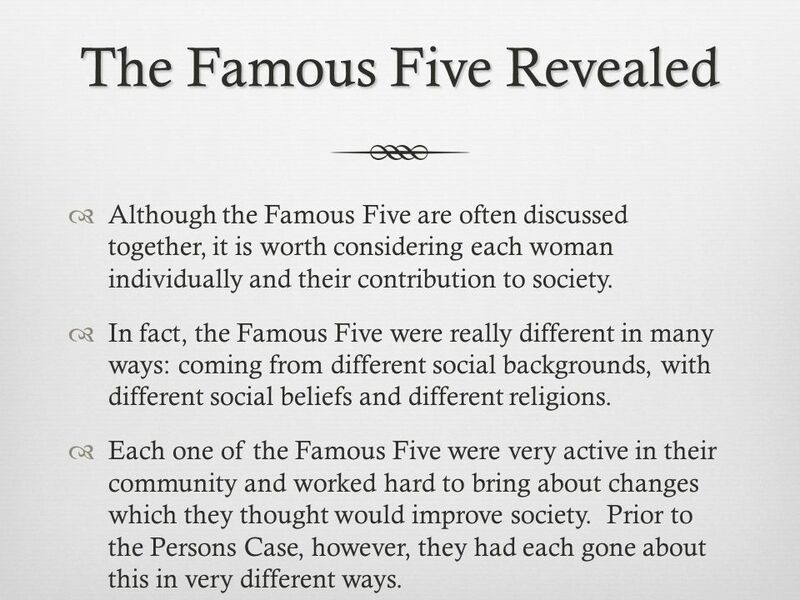 5 The Famous Five Revealed  Although the Famous Five are often discussed together, it is worth considering each woman individually and their contribution to society.  In fact, the Famous Five were really different in many ways: coming from different social backgrounds, with different social beliefs and different religions.  Each one of the Famous Five were very active in their community and worked hard to bring about changes which they thought would improve society. Prior to the Persons Case, however, they had each gone about this in very different ways. 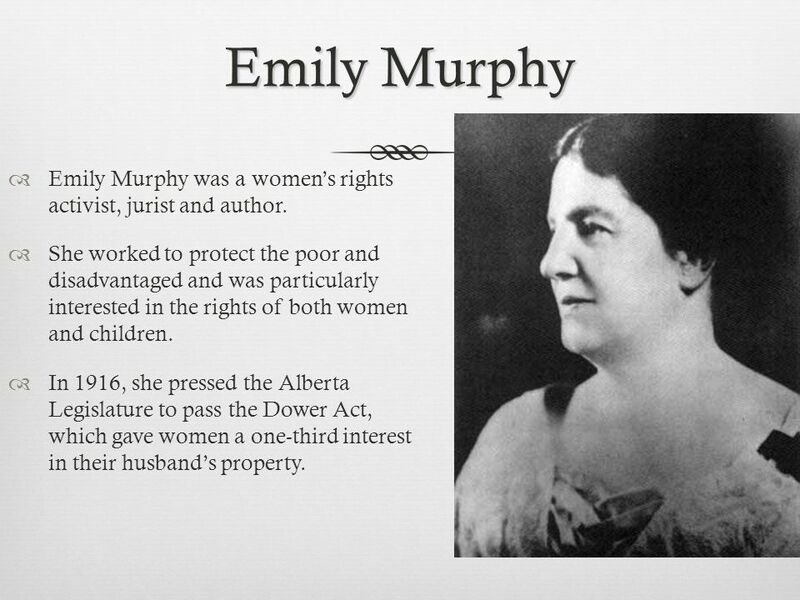 6 Emily Murphy  Emily Murphy was a women’s rights activist, jurist and author.  She worked to protect the poor and disadvantaged and was particularly interested in the rights of both women and children.  In 1916, she pressed the Alberta Legislature to pass the Dower Act, which gave women a one-third interest in their husband’s property. 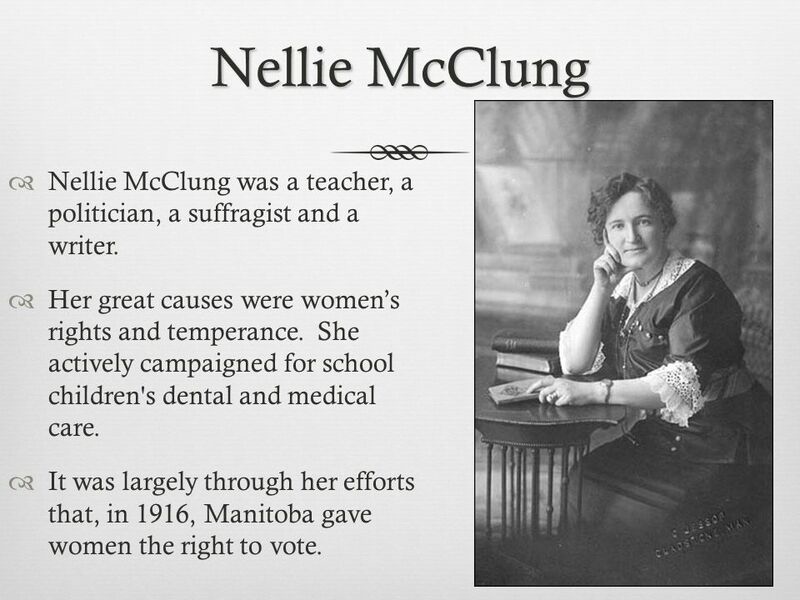 7 Nellie McClung  Nellie McClung was a teacher, a politician, a suffragist and a writer.  Her great causes were women’s rights and temperance. She actively campaigned for school children's dental and medical care.  It was largely through her efforts that, in 1916, Manitoba gave women the right to vote. 8 Louise McKinney  Louise McKinney was the first women elected into the Legislative Assembly of Alberta.  She supported temperance, education, the Dower Act, women's rights and stronger liquor control. 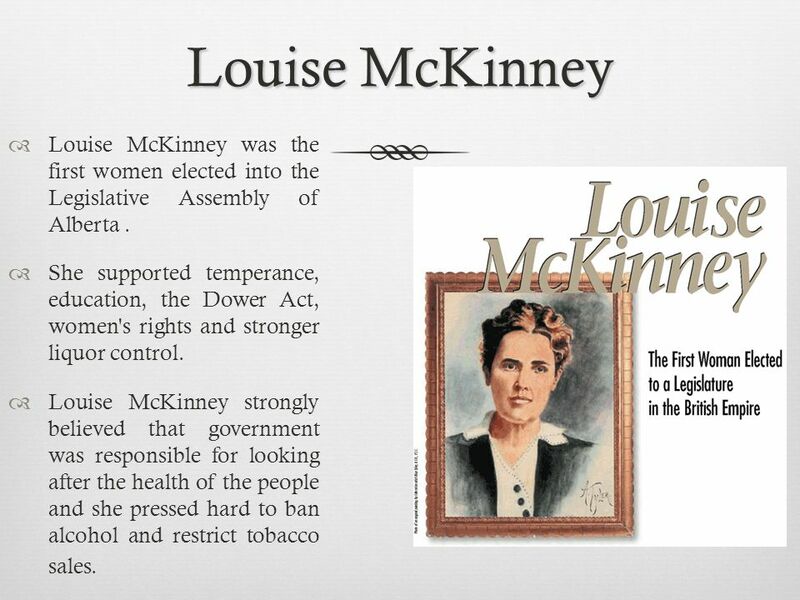  Louise McKinney strongly believed that government was responsible for looking after the health of the people and she pressed hard to ban alcohol and restrict tobacco sales. 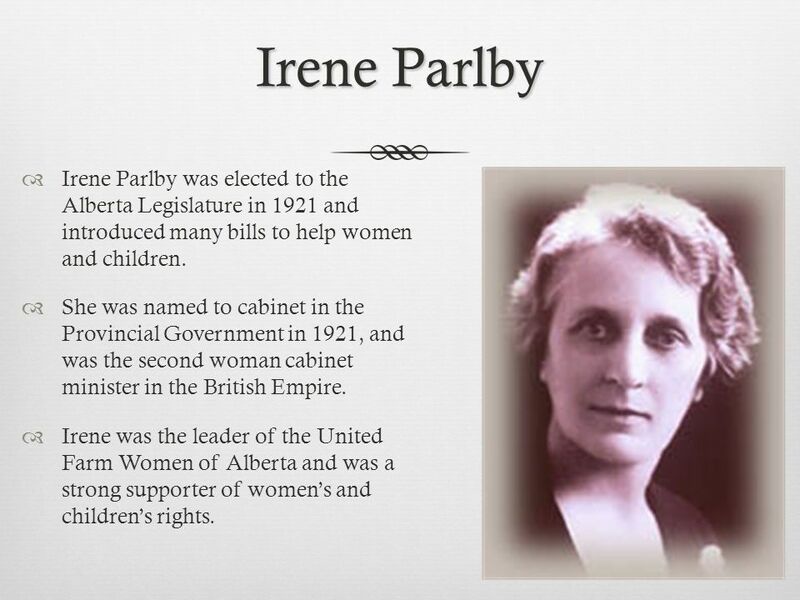 9 Irene Parlby  Irene Parlby was elected to the Alberta Legislature in 1921 and introduced many bills to help women and children.  She was named to cabinet in the Provincial Government in 1921, and was the second woman cabinet minister in the British Empire.  Irene was the leader of the United Farm Women of Alberta and was a strong supporter of women’s and children’s rights. 10 Henrietta Muir Edwards  Henrietta Muir Edwards was a social activist and magazine publisher.  She believed that Canada’s prisons were too cruel and became active in prison reform. 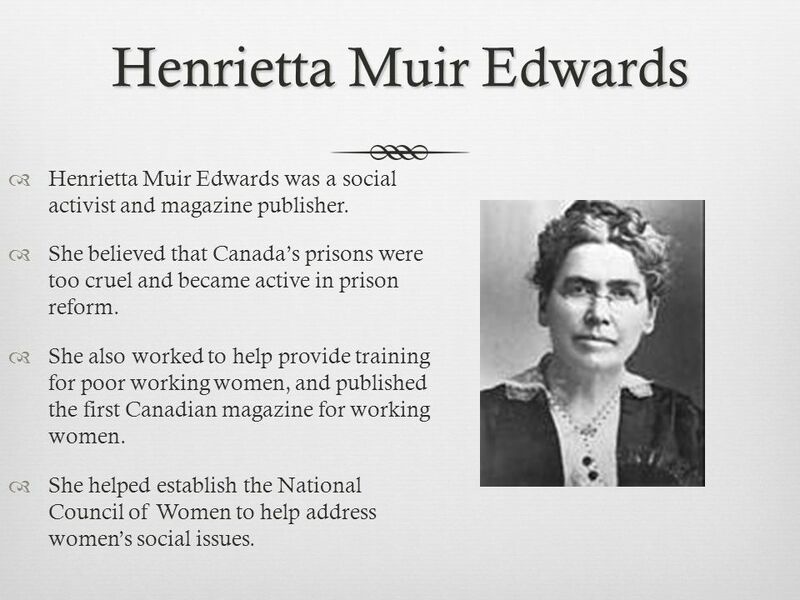  She also worked to help provide training for poor working women, and published the first Canadian magazine for working women.  She helped establish the National Council of Women to help address women’s social issues. 11 The Whole Truth  Although many of the contributions of each of the Famous Five are impressive, the value of the Persons Case and their involvement in that case must be closely considered.  As well, it is clear that each one of these women did a lot to protect and improve the rights of women and children, however, some of their attitudes and behavior was objectionable and inexcusable, regardless of what was seemingly acceptable at the time. 12 Racism and Prejudice Racism and Prejudice  There is strong evidence that many of the Famous Five were racist and prejudiced against certain minorities.  Emily Murphy, for example, in writing about the need for more restrictive drug laws, was particularly critical of the Chinese, whom she referred to as a “visitor” in this country. In 1922, Murphy published her first book, “The Black Candle”, which contained articles which attacked Asians, Jews and American Blacks. Murphy’s writings contributed to making a difficult racial issue, even more problematic. 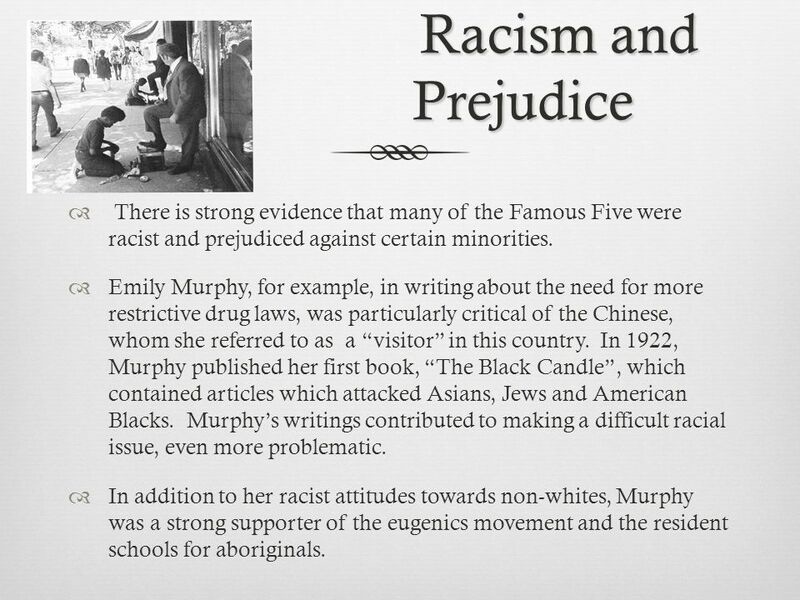  In addition to her racist attitudes towards non-whites, Murphy was a strong supporter of the eugenics movement and the resident schools for aboriginals. 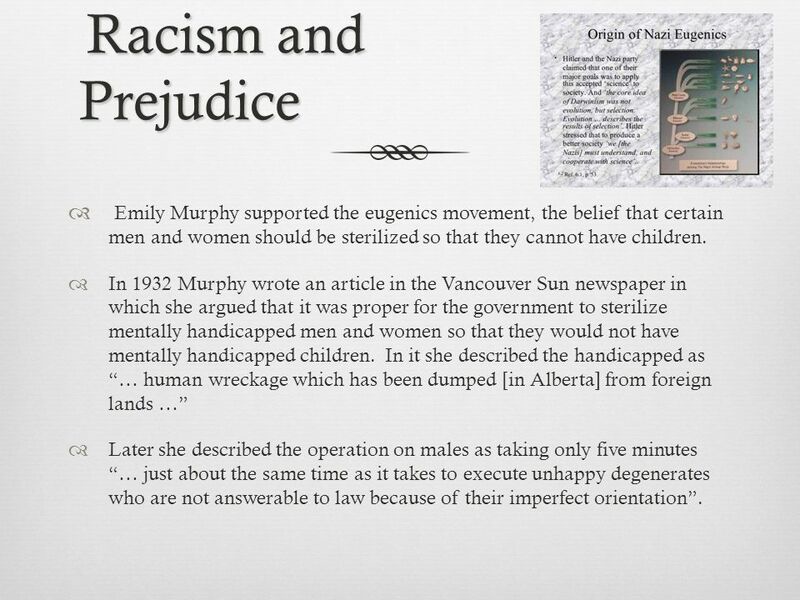 13 Racism and Prejudice Racism and Prejudice  Emily Murphy supported the eugenics movement, the belief that certain men and women should be sterilized so that they cannot have children.  In 1932 Murphy wrote an article in the Vancouver Sun newspaper in which she argued that it was proper for the government to sterilize mentally handicapped men and women so that they would not have mentally handicapped children. In it she described the handicapped as “… human wreckage which has been dumped [in Alberta] from foreign lands …”  Later she described the operation on males as taking only five minutes “… just about the same time as it takes to execute unhappy degenerates who are not answerable to law because of their imperfect orientation”. 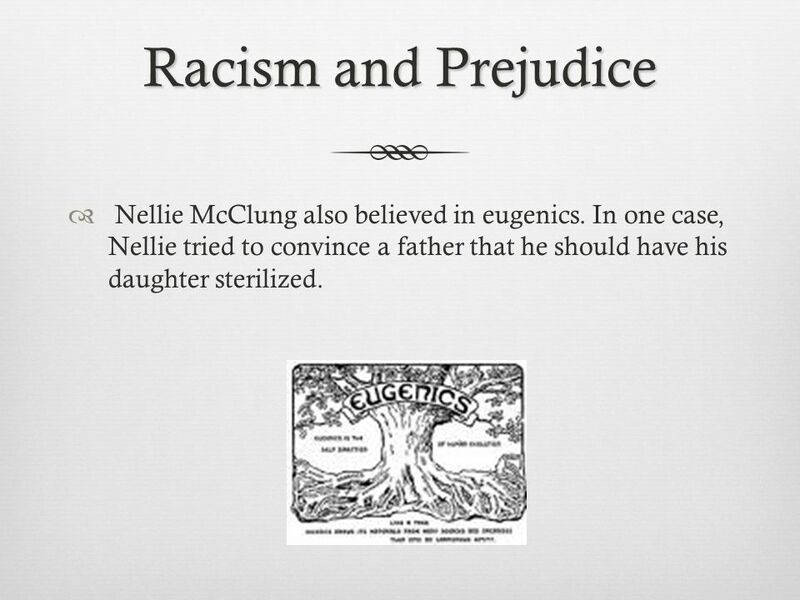 14 Racism and Prejudice  Nellie McClung also believed in eugenics. In one case, Nellie tried to convince a father that he should have his daughter sterilized. 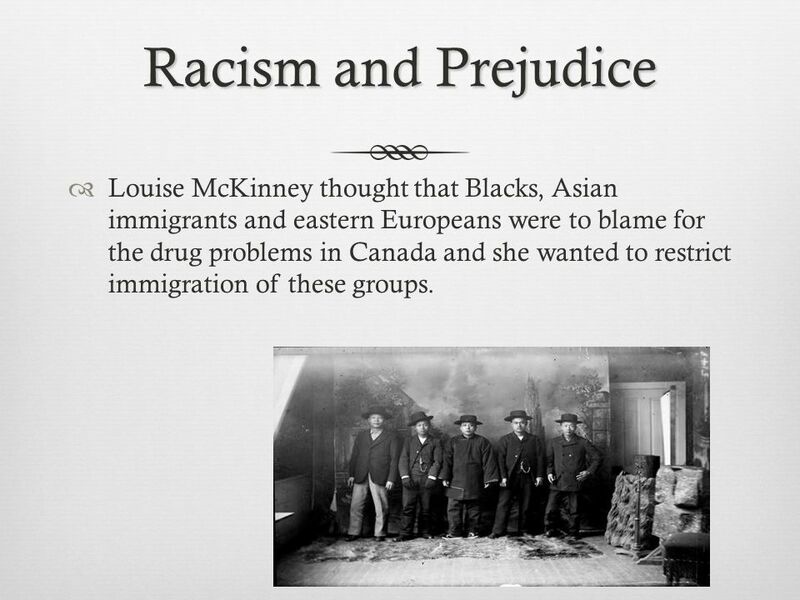 15 Racism and Prejudice  Louise McKinney thought that Blacks, Asian immigrants and eastern Europeans were to blame for the drug problems in Canada and she wanted to restrict immigration of these groups. 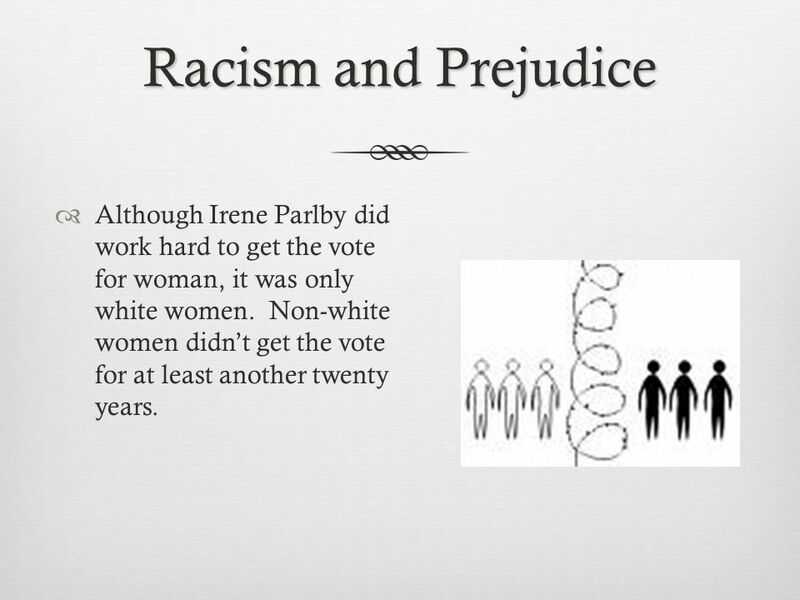 16 Racism and Prejudice  Although Irene Parlby did work hard to get the vote for woman, it was only white women. Non-white women didn’t get the vote for at least another twenty years. 17 Too Much Credit  Although Emily Murphy initiated the Persons Case, it seems that the main contribution made by the other four women was to sign the petition.  Although the Famous Five are given all of the credit for the success of the Persons Case, it seems very clear that there were many other people who were very instrumental in the success of this lawsuit.  For example, we now know that Prime Minister MacKenzie King lent both his support and financial assistance in order for the case to be heard by the Privy Council. 18 The “Over Sell” In my view, the importance of the Persons Case has been overstated. 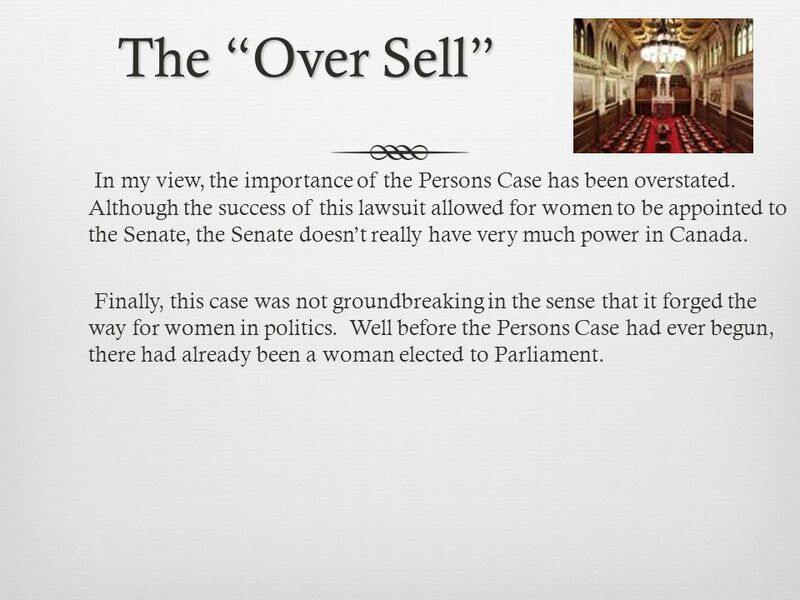 Although the success of this lawsuit allowed for women to be appointed to the Senate, the Senate doesn’t really have very much power in Canada. Finally, this case was not groundbreaking in the sense that it forged the way for women in politics. Well before the Persons Case had ever begun, there had already been a woman elected to Parliament. 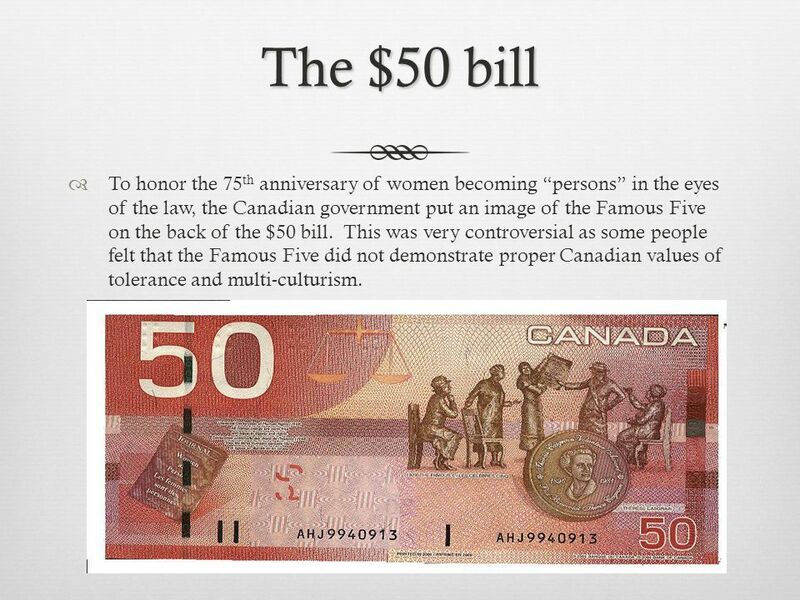 19 The $50 bill  To honor the 75 th anniversary of women becoming “persons” in the eyes of the law, the Canadian government put an image of the Famous Five on the back of the $50 bill. 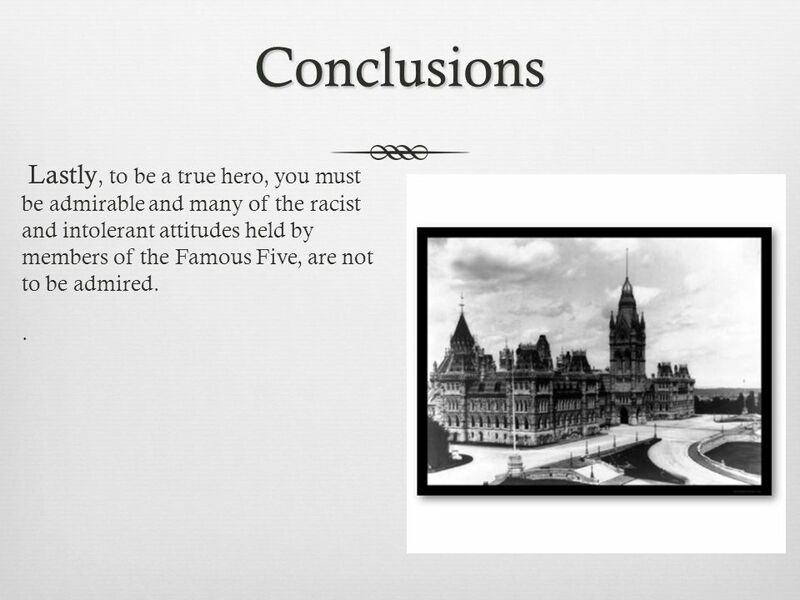 This was very controversial as some people felt that the Famous Five did not demonstrate proper Canadian values of tolerance and multi-culturism. 20 Conclusions In my view, the Famous Five, as a group, are not heroes. 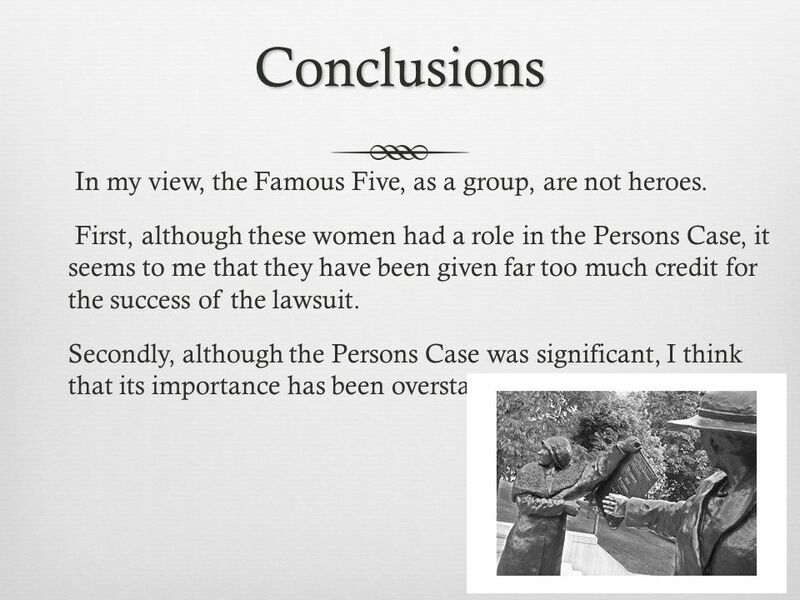 First, although these women had a role in the Persons Case, it seems to me that they have been given far too much credit for the success of the lawsuit. Secondly, although the Persons Case was significant, I think that its importance has been overstated. 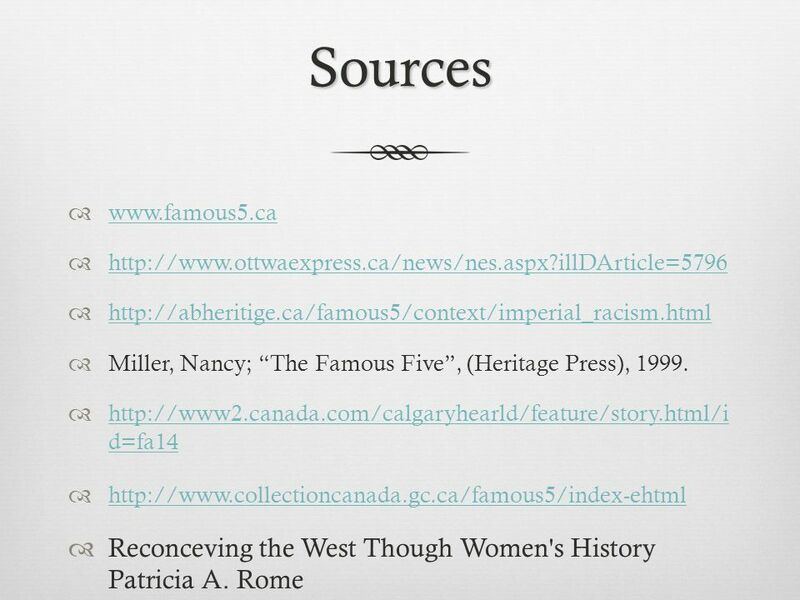 21 Conclusions Lastly, to be a true hero, you must be admirable and many of the racist and intolerant attitudes held by members of the Famous Five, are not to be admired..
Download ppt "The Persons Case  The Famous Five refers to five women from Alberta: Emily Murphy, Nellie McClung, Louise McKinney, Henrietta Muir Edwards and Irene." How effectively does Canada’s federal political system govern Canada for all Canadians? BY DANIELLE, SIARA, AND ALEX Women’s Rights. The famous Five The famous five were a group Canadian of women working together to help give all women the. 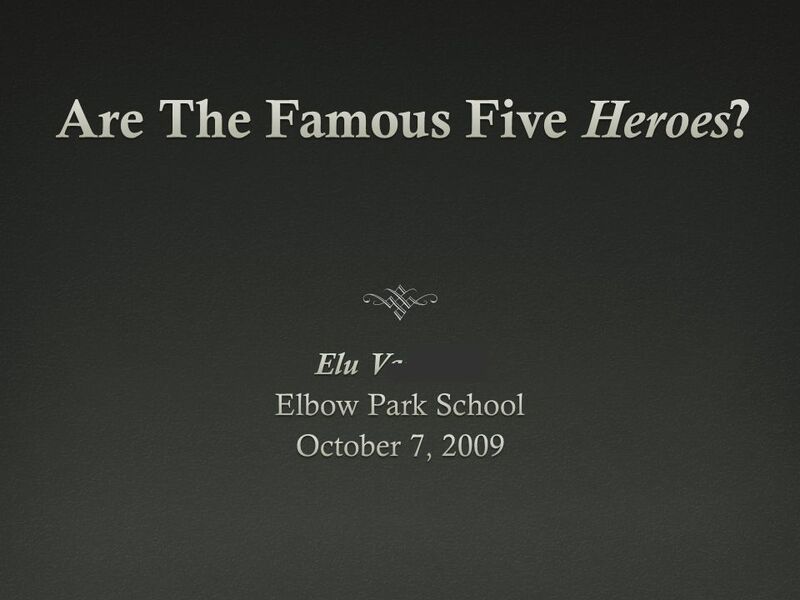 BY KIRA C. ELBOW PARK SCHOOL, GRADE SIX OCTOBER 7 TH 2009 How would the Famous Five Approach Subservience of Women and Girls in Afghanistan? Women’s Rights Movement and Prohibition in Canada After WWI. HISTORY OF HUMAN RIGHTS IN CANADA Chapter 5 - Summary. Objectives Assess how whites created a segregated society in the South and how African Americans responded. Analyze efforts to limit immigration and the. TEKS 8C: Calculate percent composition and empirical and molecular formulas. Segregation and Discrimination. Objectives Describe how women won the right to vote. Saskatchewan Labour Status of Women Office Women’s History Month Women’s History Month Opening the Door for Women. A Timeline of Women’s Rights Canada in the 20 th Century. 1.We will describe how some individuals, organizations, domestic and international events contributed to the development of identity, citizenship, and/or.